Chennai Super Kings pulled off a stunning win in their second game of the IPL 2018 by beating Kolkata Knight Riders. Absolute scenes at the Chepauk! KKR did everything they could to keep Jadeja on strike and so he decides to finish things off himself. Chennai Super Kings have chased down 203 with a ball to spare. The first time in two years the folks of Chennai are seeing their team play and what an experience they have had. This is one chase to rememember. Bravo back on strike, CSK need 5 off 3 balls, 198/5. Jadeja faces a ball that goes wide. The first ball goes for a six, and it is also a no ball, two runs off the next, Jadeja then doesn't run for the double, 7 needed off 4. Billings shuffles accross to the off stump and lifts a low full toss over fine leg. He then follows it up with another big hit, this time over long on. Pin-drop silence around the Chepauk. Good length outside off and the ball doesn't rise, Dhoni looks to cut it square but the ball just sneaks underneath his bat, kisses the inside edge and goes to Karthik who makes a good sharp catch to dismiss his CSK counterpart. This is it now. Chennai have gone about it nicely and this deficit is not an impossible one to cover. Dhoni has removed his helmet, he has pulled of some great finishes without one. 17 runs came off the 15th over, 15 of them smashed by Sam Billings. He hits two sixes and reduces the deficit to 58 needed off 30 balls. Sam Billings dropped by Uthappa, who was running backwards from mid off. It was no easy catch but also the kind that KKR need to hold on to at such junctures. How expensive will that prove to be? Well how about that! MS Dhoni first dances down the track to hit Kuldeep Yadav for a four straight down the gorund and then follows that up with a six, 16 runs come off that over. Dhoni is struggling to find the boundary while his partner Sam Billings displayed great feet while dispatching one for four. One just gets the feeling that if CSK are to win this, Billings has to take the initiative. CSK are in trouble here. Raina has been struggling and he tries to go for the pull, no power on it possibkly because of his injury. Vinay Kumar makes no mistake with the catch. Suresh Raina is limping and looks to be in some pain. CSK are in danger of losing another player to hamstring issues. Raina is shaking his head after struggling to complete a run. Kuldeep strikes off his very first over, drives away from his body and Rayudu is caught at deep extra cover. The Shane Watson wicket and Andre Russell's susequent over has sklowed things down. But Karthik will be thinking wickets. CSK have a deep batting line up and it is Suresh Raina and Rayudu in the middle. Sunil Narine comes in now. And finally the breakthrough for KKR. Shane Watson tries to pull but this time he doesn't execute it well, Rinku Singh caught at cow corner and that is that for Watson. Just one four off the fifth over bowled by Andre Russell, just the one. That makes it a good over for KKR. That should give you an idea of the sort of start that Watson and Rayudu have given CSK. They need140 to win off 90 balls so it still is a lot of work. Watson and Rayudu have got CSK off to a flier. After Watson's pyrotechnics, Rayudu gets into the groove by smashing a six and a four off Piyush Chawla to get CSK accross the 50-run mark. Dinesh Karthik makes a mess of a throw on the stumps and Andre Russll can't stop that. Five runs from there and then a six off the penultimate ball by Watson. Chennai are taking the bull by the horns here. The batsmen are under pressure and Shane Watson lets off some of it with some meaty hits. The last three balls of the over go for a four, a six and then a four again to get them off to the kind of start they need while executing such chases. Andre Russell finishes it off with a six. He has made 88 off 36 balls, CSK need to make 203 to win this match. Andre Russell show! Bravo up against Russell, Trinidad against Jamaica and it is Jamaica winning the battle. Russell smashes Bravo for three consecutive sixes off the first three balls of the over that has produced 21 runs, Bravo has been shredded today. And that is the end of the partnership that has stopped at 76 runs. Dinesh Karthik dig out a yorker and it hits him on the pads in front of leg. Umpire gives out and DK goes for the review. There is no connection between ball and bat and impact is umpire's call. That is the end of the KKR captain's innings. Dwayne Bravo, who is known to stifle opposition batsmen for runs in the death overs has been taken for a ride here. Andre Russell smashes him for two sixes, one of which is 105 metre monster that is definitly languishing somewhere in the Marina beach just near that famous light house. DK gets into the groove and that over goes for 19 runs! Much obliged, says the Jamaican. With his bat that is. Russell smashes consecutive sixes off Shardul Thakur and his over has gone for a total of 15 runs. Thakur's last ball was right in the block hole though, and caught Karthik by surprise. A quiet period in the match, much required for Kolkata Knight Riders. Dinesh Karthik and Andre Russell providing some stability after three wickets tumbled all over the place for just 8 runs. But there is no doubt that Karthik will ask Russell to go for it now. He is on strike, Shardul Thakur bowling the 16th. Dinesh Karthik hits Imran Tahir's first ball for a four and then gets just two runs from the rest of the over. But this is the time for them to conserve wickets and so they wouldn't mind a few slow overs like this one. Well this has turned out to be a mini-collapse. Tries to drive off side and ends up hitting it straight to Dwayne Bravo at point. Another one bites the dust and KKR are in need of some calmness in the middle now. CSK have their noses in front now. Uthappa punches it to cover and hesitates while taking the run. The brilliant Suresh Raina collects and gets a direct hit, Uthappa has already given up as the ball hits the stumps. And that is the end of Nitish Rana. The youngster did get a few clean hits in but Shane Watson dismissed him off the very first ball of the ninth over. Back of a length and Rana tries to drag behind square, he gets an edge and Dhoni catches it behind the stumps. Well CSK used five different bowlers for the first five overs. They have got both the KKR openers back in the hut but their worries are far from over. Robin Uthappa blasts consecutive sixes off the last two balls of Jadeja's over to spoil whatever positivity may have come out of Lynn's wicket. Lynn comes down the track for a leg side heave and misses the ball completely. The ball travels uninterrupted to the stumps. So both the KKR openers have been dismissed in the powerplay overs. Chris Lynn dropped off the very next ball. A hard pull from Lynn and Chahar, standing at square leg, dives to his right, gets the ball full in his palms but just can't keep hold of it. He was almost parrallel to the ground when he made contact, a brilliant fielding effort from him that is appreciated by his team mates. Sunil Narine skies a leg side slog on a ball wide outside off, it balloons up in the air and is suspended for what seems like hours, Raina commits and makes no mistake. A good catch, a big wicket. Chris Lynn lets the first ball go for no runs and dispatches the second to the boundary with a slash to point. He then rotated the strike, Narine on strike and the second and third ball he faces for cosecutive sixes. MS Dhoni says that Shardul Thakur and Sam Billings are in for Mark Wood and the injured KedarJadhav. Only one change for KKR: Tom Curran in for Mitchell Johnson. So we have had the toss and Chennai Super Kings have elected to bowl first. Kolkata Knight Riders showed how dangerously efficient their batting can be while chasing. Now it will be put to test to set up a good total. When the first season of the IPL was played without Chennai Super Kings in it, there were peaceful protests at the Chepauk stadium demanding the return of their beloved yellow shirts. But charges against the franchise were serious ones and they did end up serving their two-year ban. Now they are back and their popularity seems to have only increased in their absence. There were crowds of over 10,000 at the stadium just to see the team's practice sessions. Nearly 60,000 are expected to attend this match and so, here we are, awaiting the toss for CSK's first match in Chennai this season. Chennai Super Kings pulled off one of the greatest escape acts in the history of the IPL when they beat defending champions Mumbai Indians by one wicket in the opener. While the players would be hoping that this match is not as difficult as the first one was, the Chennai crowd will be hoping to see something more than a one-sided affair. 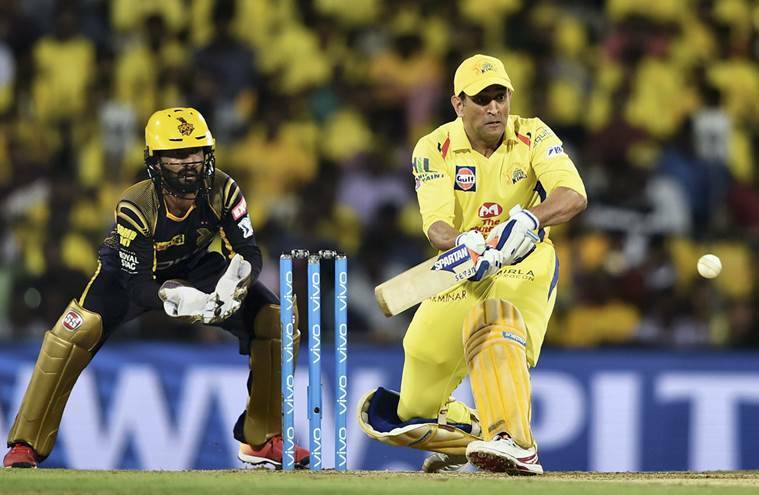 Chennai has not seen its favourite yellow brigade take the field led by Thala MS Dhoni and the city's love for its IPL franchise is no secret. Provided nothing untoward happens owing to the developments over the past few days, one can expect a cauldron at the Chepauk stadium. Dwayne Bravo is in good touch and he showed it in the previous game while the Chennai crowd would expect skipper Dhoni to get into the groove and gather some runs under his belt. CSK will miss Kedar Jadhav whose maximum in the last over against MI made it a cakewalk for CSK as he has been ruled out of the tournament due to hamstring injury.